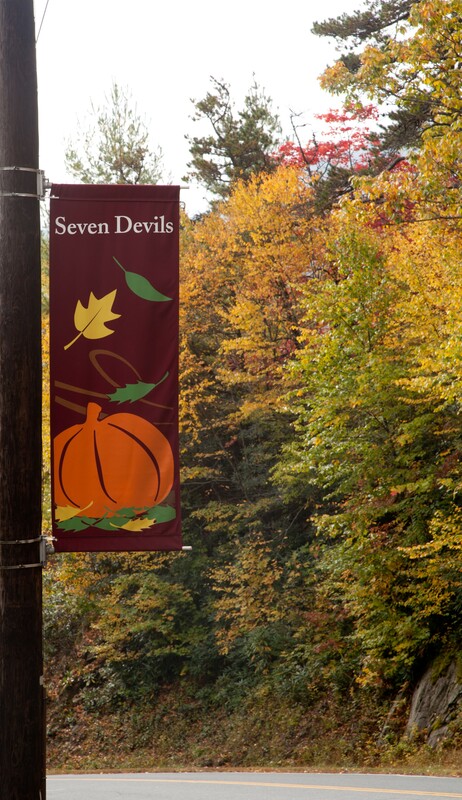 The Town of Seven Devils sits in the heart of the North Carolina High Country, a setting famed as a popular retreat in the midst of Winter beauty. There’s no better way to enjoy the Appalachian lifestyle than to rent or own a cozy cabin or condo in Seven Devils, the first mountain resort development in North Carolina to become a town. Take it all in from your deck, but when adventure calls, the Hawksnest Snowtubing & Zip Line park is right in town. 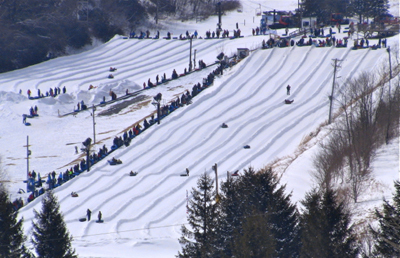 One of the regions top destinations for family fun in the snow--no skis required! Hawksnest Zip Line park is also one of Eastern America’s most extensive zip line attractions. Be sure to call and reserve your zipline tour or snowtubing adventure in advance! Otter Falls is just a minute or two away. Visit our Otter Falls page to learn more about the trail and download a trail map! If you'd like to stay on the mountain and have some free outdoor fun, visit our Town tennis courts on Grandfather Circle, now with Pickle Ball lines! Right next to the tennis courts is our playground, now with two new pieces of play equipment and a picnic area for all to enjoy. Bring your family and check out these amenities on sunny Winter days! When you’re ready to leave town, the Southern Appalachians’ most exciting mix of outdoor activities is right out your door. 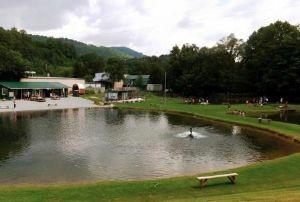 The Grandfather Trout Farm is close to the entrance to Town and a fun place for the family to fish or mine gems. It is a keep what you catch fishing experience with several size ponds. The Trout Farm is open year round 10:30AM until 5:00PM. Check out the website above for more details! The Blue Ridge Parkway is known for many things, including hiking and scenic drives, even in the Winter season. The Grandfather Mountain portion of the Blue Ridge Parkway is the most scenic section of “America’s Most Scenic Road.” Loop this entire stretch of the Parkway by taking NC 105 south to Linville, then left on US 221. Once you have passed the Grandfather Mountain entrance, go North on the Blue Ridge Parkway. Visit the Grandfather Mountain attraction on the way, where the Mile-High Swinging Bridge connects two peaks and you can view local wildlife in natural habitats. Explore the Blue Ridge Parkway and discover other hiking paths that include Linville Falls, Beacon Heights, and Rough Ridge. They could fill a number of active days, all featured with Seven Devils in Our State magazine. Don’t forget canoeing or kayaking, or rent a boat at the Parkway’s Price Lake. Bring your bike and cruise the Boone greenway, or go mountain biking at Boone’s bike park Rocky Knob. Visit Tweetsie Railroad in closeby Blowing Rock—ride the train and enjoy family friendly fun. The historic heritage drama Horn in the West, and adjacent Hickory Ridge Living History Museum are both minutes away in Boone. The Mast Store is in Boone too, and the historic original Mast country store is in Valle Crucis, along with the Mast Store Annex and Candy Barrel. Or just come up for culture and the arts! There’s music, dance, drama, and more at Appalachian State University in Boone, and at the Lees-McRae College in Banner Elk. It's all just minutes from beautiful, desirable Seven Devils.